Rainbows and glitter and sprinkles oh my! Unicorns are making a comeback in a big way and I’m loving the fun nature of it. It brings me back to my Lisa Frank loving days and the hyper vibrant unnatural colors everywhere. 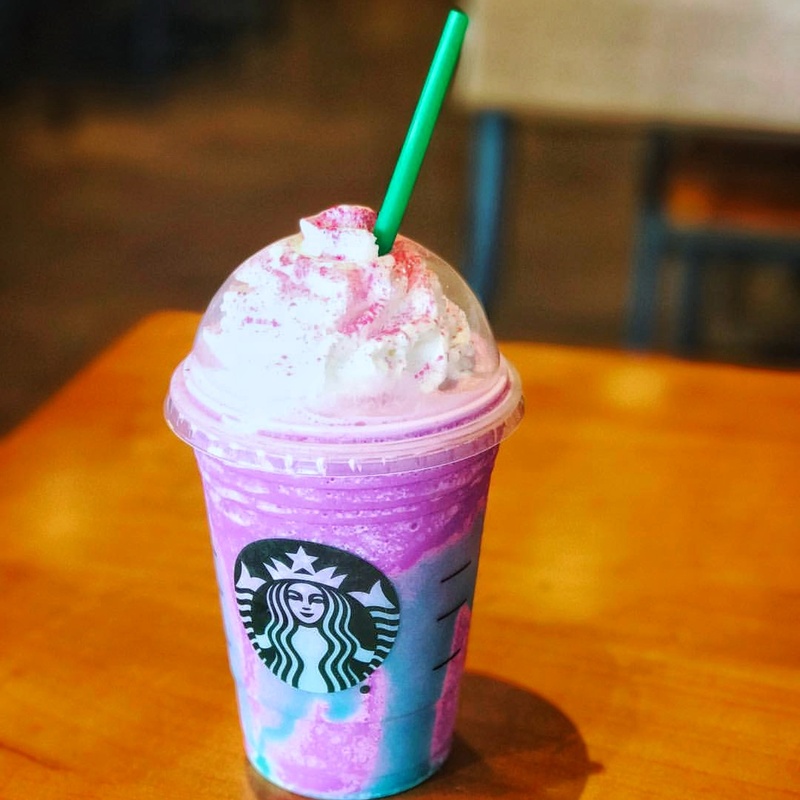 This trend became so mainstream even Starbucks had to cash in on it and now there are colorful glitter drinks all over the city. The OG of this mythological drink trend is The End Brooklyn, right off the Metropolitan L station in Williamsburg. This unconventional coffee shop is serving up anything but your regular old cup of Joe. 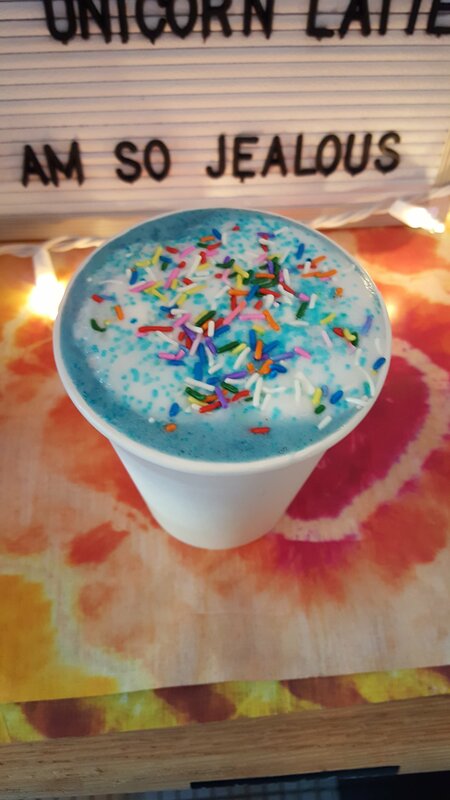 The healthy Unicorn latte is made with Blue algae, lemon, honey, and cayenne and vegan sprinkles on top. A surprisingly citrus taste that gives you all the good vibes for this warm refreshing and soothing latte. Also if you are feeling adventurous try the hot chocolate with CBD that will relieve your anxiety. This unicorn latte will make you feel good, it will set you back $9 but it is unique and that’s what counts. This frappuchino was only around for 5 days but the hype around it took the internet by storm. It stands out against the other frozen drinks at Starbucks because the bright pink and blue swirl with of course edible glitter on top. 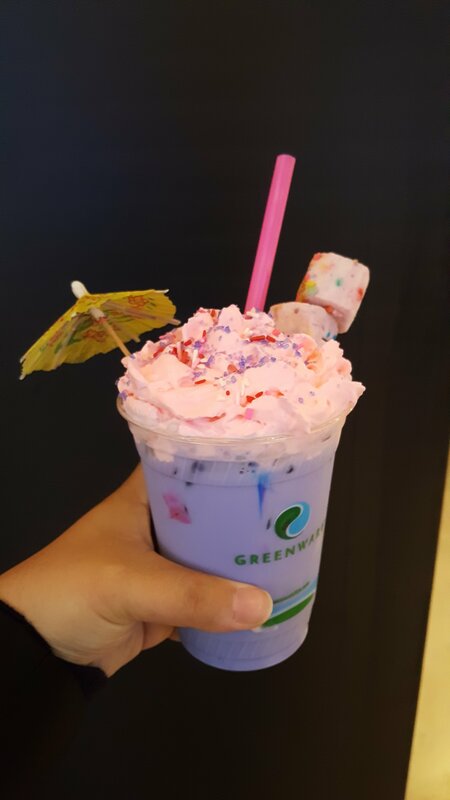 The name, unicorn frappuchino, is what drew the crowds. The flavor combo was interesting… and had some mixed reviews. It was sweet fruity mango that turn sour and changed colors when you mixed it. The sweet sour combo didn’t work because the sour was overpowering. But everyone can appreciate a little glitter sprinkle. It is gone now and hopefully isn’t making a return. When you think of American Eagle Outfitters drinks are definitely not what you think of first. But their time square location is serving up some pretty cool refreshments when you need to recharge from all that shopping. With drinks ranging from coffee, tea, To fun sodas to their now famous Pegasus drink. There is no written menu of what is in the drink but that doesn’t mean it is shirt of customization aspects. The list of questions you get are what color, what flavor, marshmallows or nah, and what fun straw do you want. Flavor-wise depends on what you pick, I went with cotton candy because it seemed appropriate. This not the purple drank you are think of but the Pegasus is a milk, white chocolate, flavor cup of happy. It is overpriced $9 but it is fun and tasted pretty good. Unicorns are not only in our drinks they are turning in macrons, cakes, and ice creams, etc. Let me know in the comments if there are any unicorn themed foods I need to check out! Next Next post: Trend: Brunch Pizzas?